Thursday 22nd November saw the Salford Red Devil Festival host the inaugural A-Plant sponsored Touch Rugby League Schools festival at the Salford City Stadium. With the Foundation welcoming mixed school teams from across the region, the tournament saw 9 teams from 5 schools, build on training and coaching given in recent months by Foundation Community Coaching staff, putting their skills into practise against other Year 5 & 6 teams. Salford Red Devils First team players, keen to provide further encouragement. With an emphasis on team work and participation, all student players were rewarded with a certificate and trip around the Club Museum, with Foundation coaches stressing the benefits of healthy eating and active lifestyle choices. In attendance from A-Plant to lend his support and enthusiasm was Director Asif Latief. 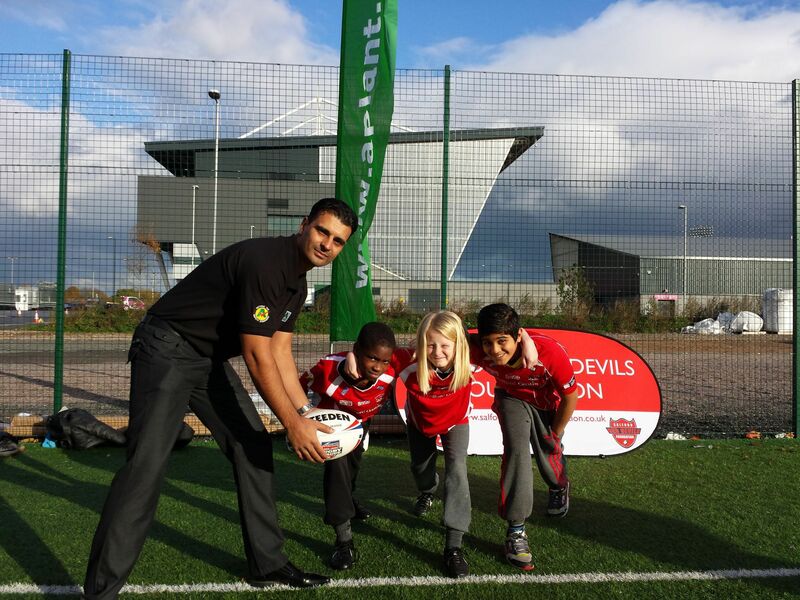 As a supporter of Rugby League in the area, as well as being a long term ‘Friend of the Foundation, Asif was keen to engage local school children with sport and highlighting the benefits an active lifestyle can bring. Asif said, “We are delighted be a partner with Salford Reds Foundation in giving school children around Greater Manchester and beyond, the opportunity to experience the importance of sports and physical fitness in a fun and interesting way. "As a company we try to give something back to the community in areas where we operate by investing in worthwhile initiatives such as this. Through sports, children can build up valuable skills which can help to raise their aspirations, improve self-confidence, instil discipline and promote team work while learning about the importance of physical fitness and healthy eating. "The issues tackled on this programme are extremely important to children’s health and wellbeing so we are very proud to be sponsors". With teams from St Richard’s, St Anne’s, Gorse Hill, St Willibrord’s and Holy Cross, The Friar’s and All Saints, school teams from Salford, Manchester and Trafford were represented in what is hoped to become a regular event. Rosie Knipe, teacher from Holy Cross and All Saints said, “It’s been a fantastic event here today, and very well organised. What’s particularly pleasing to see is how the children have progressed, having not previously been exposed to Rugby League. After training from the Foundation coaches, they are now really pushing on and having a great time. We’re very much looking forward to the next event”. For additional information on the Salford Red Devils Foundation activity in schools or the community, please contact us at the community offices on 0161 820 2739.